A day of luxurious pampering at One Spa at The Sheraton was just the treat we hoped it would be. The first impression of One Spa is calmness and tranquility, leaving me feeling completely at ease before I’d even started. I began with a massage and once my therapist had helped me to choose the oils I wanted the tension in my neck and shoulders slipped away under her expert hands. Now for the bit I’d most been looking forward to – the roof top hydro pool. There is something just so decadent about lying back in warm water in the fresh air and thinking about (and watching) all the people working away at their desks, whilst you have not a care in the world. The Thermal Suite is inspired by heat treatments used by the Celts and Romans and I have to say they must have known a thing or two about how to soothe away the cares of the world. 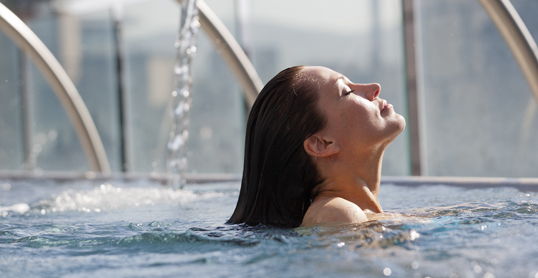 There’s a Laconium (dry heat), Aroma Grotto (steam infused with herbal and aromatherapy extracts), refreshing rainforest showers, Tepidarium (thermal couches to relax the muscles and release toxins) and a choice of two saunas. You’ll notice that I’ve skipped the facial. I have a mild skin condition which is easily upset, so I thought it safer not to risk even the mildest irritation before a big night out, but judging by the recommendations from others I’ll definitely be trying it another time. Overall this was a blissful day and I’d highly recommend it to anybody!